The Adams Super LS is the latest in a long line of drivers by Adams, a favorite among equipment enthusiasts. One of the first new drivers I used in my rebirth as a golfer was an Adams Speedline 9032ls. I liked it a lot, found it to be a wonderful upgrade from the decade-old TaylorMade it was replacing, and it had an X-stiff shaft, which was closer to a proper fit than I’d had in the past. So, when the 2013 batch of Adams Speedline clubs starting arriving around the holidays, I was intrigued and had warm memories of my previous Adams clubs. I haven’t had much time to put the new models to the test, but . 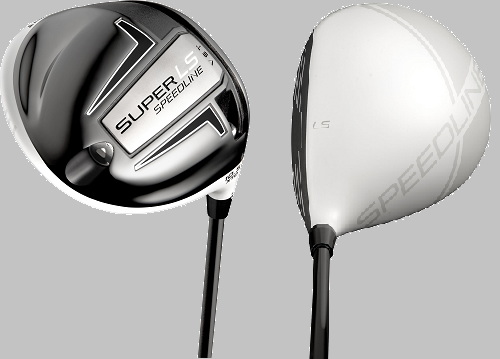 The Super LS is positioned as the players model and the Super S is more forgiving for the higher handicapper. The 2013 line of Adams clubs includes Super LS and Super S drivers, fairway woods and of course, since this is Adams, hybrids. Continue reading for slideshows of pictures of each of the new Adams offerings. This year Adams, purchased in 2012 by TaylorMade Adidas Golf, moves away from the silver paint of the past couple generations. Falling in line with TaylorMade’s incredibly successful drivers and fairway woods, Adams went with white heads in the Super LS and Super S.
There was some push back against crown graphics in the equipment discussion boards, but in person, I don’t mind them and don’t see them as a distraction. My hunch is that we’ll be seeing more manufacturers using the crown as a design and marketing position in the coming years. A key feature of Adams has been their Velocity Slot Technology, which is present in all this year’s woods and hybrids. It’s the first time they’ve added VST to the drivers. I’m excited to get these clubs out to the range and put them through the paces. In a quick session, I found that both drivers set up beautifully to the ball, appearing to sit just a hair open. Just like on the R11, I buy into the theory that the white head frames the ball nicely. Thanks to an adjustable system on the drivers, I look forward to experimenting with the Super LS stock Kuro Kage shaft and some others that might better fit my swing. The Kuro Kage is a highly buzzed about new Mitsubishi Rayon shaft (maker of well-known models such as the Diamana line, Fubuki and Bassara). I’ll also be curious to see how the Super S performs with the Matrix Radix, which is supposed to launch the ball lower as the stiffness increases. It will be interesting to see if Adams will offer shafts for purchase a la cart. For my ball speed I’ll need an X-stiff, and it’s unclear if Adams will offer shafts aside from the stock models. The Super LS and Super S fairway woods follow last year’s breakout hit, the XTD fairway wood that became one of the most talked about clubs in the industry. The Super LS brings back the titanium fairway wood. I spent all of last season trying to get my hands on the XTD with no luck, so it’s right on top of my 2013 wishlist. Like the drivers, the Super S is designed with a higher handicap player in mind, and in my quick demo, I found that the Super S is very easy to hit, especially off the fairway. I’ve always struggled with hybrids, but this year’s Adams Super LS and Super S are more like a blend between hybrid and fairway woods. With a heftier shaft (typically I play a 90 gram, x shaft in a hybrid), I think one of these might find a spot in the bag. I particularly like how the Super S seems to launch the ball the same no matter where on the face I was making contact with my rusty winter swing. The only hybrid that’s ever seen extended play for my was an Adams Tech V3, and the Super S has a similar shape.